D-M Products Inc. receives 2011 Crystal Achievement Award | D-M Products, Inc.
Glass Magazine has announced its 2011 Crystal Achievement Award winners. Selected by a panel of judges representing all segments of the glass industry, the awards recognize the best products and glass applications the commercial, retail and fabrication markets have to offer. “The level of competition this year … shows a tremendous effort within our industry to continue to push the boundaries, while still providing quality on all levels to satisfy the architectural community, as well as building ownership,” says 2011 Crystal Achievement Award Judge Les Young, project manager, W&W Glass LLC, Nanuet, N.Y. The Consol Energy Center in Pittsburgh is the first National Hockey League arena to earn Leadership in Energy and Environmental Design Gold certification from the U.S. Green Building Council. The building’s signature element is a massive glass façade that faces downtown and undulates to emulate the flow of Pittsburgh’s three rivers. There also is a precipitous change in elevation across the building site, prompting the creation of a soaring six-level atrium and wide-open concourse that enhances city views and helps visitors stay visually connected to the action on the ice. To balance the need for light, views and thermal performance, the architectural firm Populous specified Cradle to Cradle-certified Solarban z50 glass by PPG Industries that features a subtle, steel-blue-gray tint, a solar heat gain coefficient of 0.31 and visible light transmittance of 51 percent. 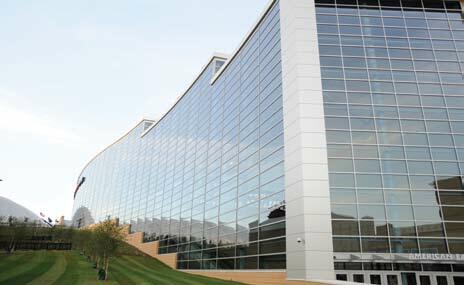 Even with this extensive use of glass, the Consol Energy Center achieves annual energy cost savings of more than 30 percent, according to LEED documentation. Three companies—Universal Glass and Metals Inc.; D-M Products, Bethel Park, Pa.; and Kawneer Co.—solved the design and logistical challenges associated with the curvy, multi-level curtain wall, which was fabricated from 12-by-4-foot lites of 1-inch insulating glass, each weighing 350 pounds. “These are large pieces of glass, and the curtain wall follows the serpentine shape while going up a steep hill,” says Tom Kesler, project manager for Universal Glass and Metals, the contract glazier for the project. D-M Products bid the job with Universal, and installed the curtain wall framing. “We faced challenges getting access to the job site, working off the hill, with heavy pieces of glass. …We used a crane to set the glass, in conjunction with swing stages and lifts,” Kesler says. The arena also features Kawneer’s Trifab VersaGlaze 451T framing, with an Isolock thermal break, for thermal performance and energy efficiency. 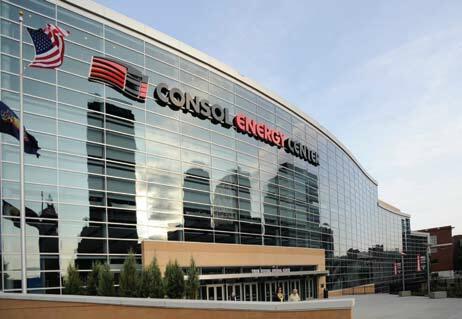 To achieve Gold certification, the Consol Energy Center earned 42 points on the LEED scale. For more information on the project, see this article in the November 2010 issue of Glass Magazine.